Air flow rates between 35 and 1411 cubic feet per minute (CFM). Outlet 2.0-8.0 in. (5.0-20.3 cm). For agriculture & construction use. reducing sleeves for a variety of outlet choices. Racor Engine Air Precleaners are powder coated for a durable, corrosion-resistant finish. Racor Engine Air Precleaners are usually installed in place of the rain cap, dust bowl, or aspirated precleaner (exhaust system). In some applications, they can be mounted directly to the air cleaner. Air enters the system through a prescreen that removes large debris. It then flows through static vanes causing the air to spin. As the air spins, centrifugal force separates dust, dirt, insects, rain and snow from the air stream. 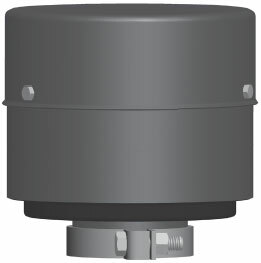 The swirling air drives a high velocity rotor that acts as a blower evacuating contaminants through special discharge ports in the side of the unit. Only purified air flows to the air filter elements. Complete specifications are provided on the reverse of this page.